YIX30L high performance battery by Scorpion. These are no ordinary replacement batteries, but a true high performance AGM battery that is designed to meet and even surpass the standards set by your vehicle’s OEM manufacturer. Scorpion is dedicated to manufacturing only the best replacement batteries, to uncompromising standards. manufactured by one the largest makers of motorcycle and ATV batteries in the world. While these batteries are ‘new’ to the US market, they have become one of the largest powersports battery manufacturers in the entire world. 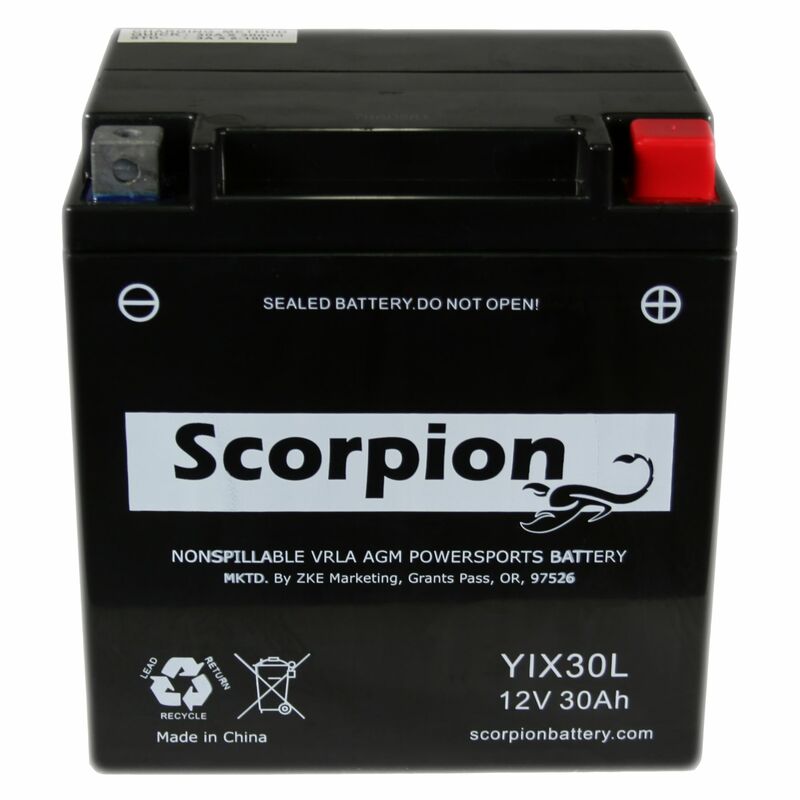 By continually updating and modernizing their manufacturing process, the makers of Scorpion YIX30L batteries have achieved a position in the Powersports industry that is unrivaled around the world. 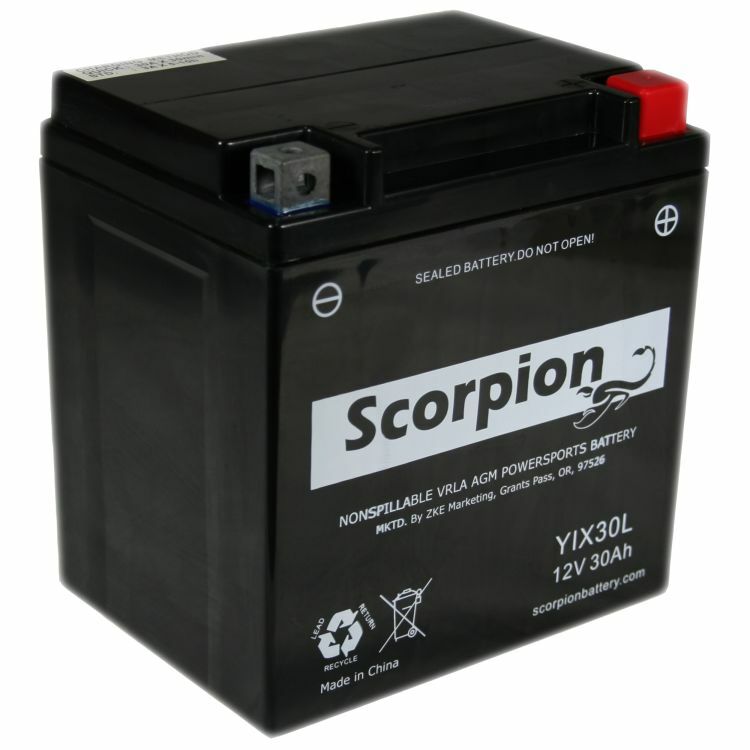 Scorpion is the ONLY battery in the U.S. to currently offer a real warranty on their products. 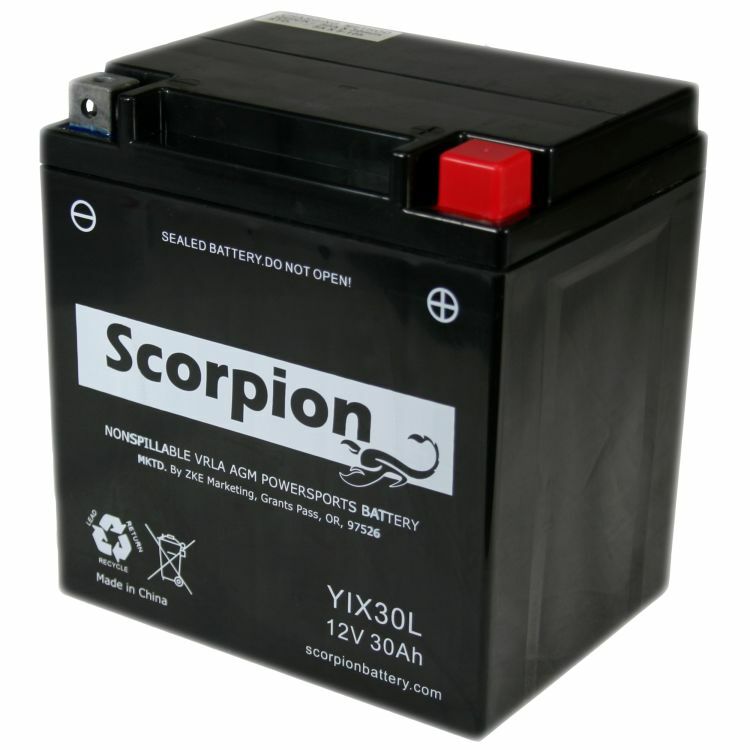 ALL other manufacturers leave the burden on their distribution network to replace and account for battery failures, while Scorpion batteries are actually backed by the manufacturer. What does this mean to you? This means that Scorpion is confident enough in the quality of their batteries that they are not afraid to stand behind them. The rest simply ask their distributors to ‘ante up’ and cover the failure. This confidence alone is why BatteryStuff is excited to offer this new battery. Be assured that with YIX30L High Performance Powersports Battery you are buying quality, at an affordable price. This is the High Performance version of this battery offering a respectable 400 CCA. Scorpion recognizes that batteries are made of lead, not gold. With that in mind, Scorpion has struck a fine balance between a high quality product and a decent price. You will be impressed with the YIX30L High Performance Powersports Battery! Rated 4.83/5 Stars from 24 customer reviews. Do you own the sYIX30L? Please, tell us what you think about it. It helps us provide you with better products. Please note that it may take up to 72 hours for your review to appear. Pros: Outstanding service, correct and super fast delivery. Again, solutions for battery needs without a headache, or hassle. You guys have it down to the science of slick, nice to do business with. I ordered the wrong battery first time...TOYALLY my fault. I called them and absolute NO HASSLE return. I made the mistake , not them but they were very professional. I WILL order all of my battery needs from them in the future! Pros: I bought my motorcycle battery from BatteryStuff. Even with free shipping, it came in in less than a week. Very satisfied! Pros: Great service, Great product, Great price-I'll purchase again. Cons: I'm sure they don't want to give the product away! Pros: Very fast free shipping and easy purchase from the BATTERYSTUFF Crew. Installed the SCORPION BATTERY in my 2007 Polaris Ranger XP. It works perfectly and looks very well built!!! Other sealed batteries were much more expensive and after talking with Jeremy in tech support, I decided to give the SCORPION a try. So far, no problems. Pros: I do not have to add water to the battery. Pros: Excellent price Perfect fit All cable nuts and bolts included Withstands freezing temps Stands up to every day farm use. My Polaris 600 is used daily around the farm and in the forest while doing logging. It gets shut off and restarted many times a day and the Scorpion Battery cranks good and fast every time! Thanks "Batterystuff.com"
Pros: Fast shipping! Fits and works fine. Cons: This is a replacement of the same battery. First one lasted just over 3 years. Pros: Had problems with short life with lead acid batteries on my four wheeler. Tried this AGM and it fit perfectly and so far starts everytime after sitting weeks at a time. Pros: Excellent Battery. This is my second Scorpion battery. Works Great! Would purchase again. Quick shipping right to front door. Very good company to deal with. Wouldn't waste my time with a lead acid battery from brick and mortar store when I can get AGM for excellent price. Pros: Compact, fairly rugged battery, shipped with several attachment screws, washers, etc. Harley Davidson (touring model) replacement battery. Excellent customer support. Cons: First received battery was non-functional due to shipping damage. Thank you USPS. Suggest customers request UPS or Fed-Ex shipment. Pros: Battery fits and lots of cranking power. Cons: There had to be a location on the battery that was not sealed properly because I had small droplets or sweating of sulphuric acid appear on the casing of the battery when I unpacked it from the shipping box. I wiped it clean and installed it being careful to keep it upright. I haven't detected anymore more sulphuric acid with the battery installed in the normal position. Is there anything I should know about regarding the battery and this situation? Thanks. David. Pros: Great service!! Super fast on delivery. Second battery I've bought won't be the last! Pros: Excellent battery to fit my 1980 BMW R100RT. Web site was easy to use and shipping was fast. Packaging was great and the battery came fully charged. Pros: Man,this battery arrive quickly.They must really mean it when they say spill proof design because they shipped it sideways,and when I installed it my BMW K100LT started right up.I put a trickle charger on it anyways to make sure I have a full charge,but I have faith.Since I have dropped my bike on wet roads and gravel before "spill proof" is pretty important to me. Cons: No cons that I can see.It's black and if it were red it would match my bike better? First battery of this brand,but if it lasts more than a year then for the price I can't beat it. Pros: Battery came pronto during Thanksgiving week, ordered it Monday and there it was Friday, nice box, no damage, no leaks. Hows that for service. Fit in my 1984 R100RS BMW like a glove. I left it on maintenance charger overnite just to be safe. Next day fired up like gangbusters. Great service, great price, its all good. great place to do business with, I'll do that for sure. Pros: I ordered this battery for my grey bearded 1974 R100RS BMW on the Monday before Thanksgiving Thursday. Much to my surprise the battery arrived Friday, the day after Tgiving, quick eh? (I now live in Missouri). Packing was great and no damage or acid spillage at all, the battery arrived with 12.4v charge; about 80%. Let it sit for a day upright to settle itself after the shipping, then gave it a light charge off and on over the next 3 days. Sort of babied it, why not. Anyway, it fit right in place during installation smooth as silk, then cranked that big twin like a blender! Right on...! I could not be happier at this point. Expect about 6 years on this one. Cons: did not get a free flight to Hawaii for being the one millionth customer. Everything else was as good as it gets. like the AGM battery vs the flooded plate jobs I've always had in the past. Do yourself a favor and get one of these if it fits your bike, you won't be sorry. Pros: Great price, fast shipping. Had a problem but was taken care of extremely fast. Terrific personal service I recommend highly. Pros: This company rocks! These folks know their battery stuff. Very knowledgeable. Awesome customer service. Lightening fast shipping. They had a 30 lb battery at my house in Texas all the way from Oregon 2 days after I ordered it. Amazing. I'm never using anyone else again for battery stuff. Pros: PRICE!!! Starts my bike (BMW K100RS) without hesitation even at temperatures down to 15degrees F. Sealed maintenance free is a great feature for a bike where it's a royal PIA to get at the top of the battery to top up the electrolyte. Cons: Had to mess with the cable terminals to attach to the battery. Not set up for BMW cables. Pros: Shipping time rapid and as promised. Installation easy as the dimensions were accurate. Cons: Since the battery was just installed, it is a bit early to assess properly but so far it is flawless. So far, a great company and product, we hope for continued positive results.